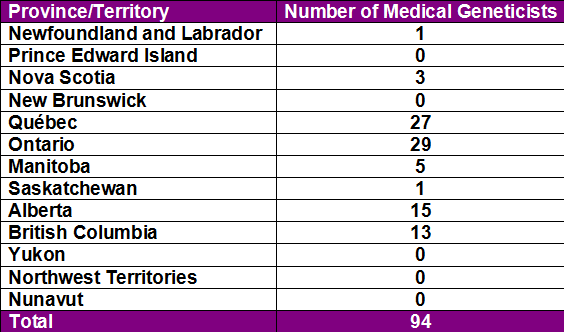 Source: CICH Map and Table created using data adapted from The Canadian Medical Residency Guide. Medical Geneticists in Canada. 2015. https://www.cma.ca/Assets/assets-library/document/en/advocacy/Medical-Genetics-e.pdf -accessed July 25, 2017. Access to medical geneticists and the services they provide is not equitable across the country. For example, 60% of all the medical geneticists reside in Ontario and Québec whereas there are no medical geneticists in New Brunswick, PEI or the Territories. 1The Canadian Medical Residency Guide. Medical Geneticists in Canada. 2015. https://www.cma.ca/Assets/assets-library/document/en/advocacy/Medical-Genetics-e.pdf-accessed July 25, 2017.